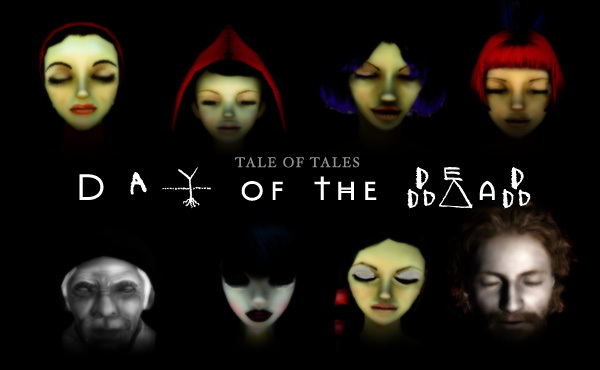 From now thru November 2nd we are selling a bundle of the three Tales of Tales in which death plays an important part. In The Path, all six Red Girls find their end after meeting their wolf. In The Graveyard, the old woman may die while listening to a song. And in Fatale, John The Baptist loses his head because he does not return the love of a princess. We’re certain playing these characters will bring you closer to the commemoration of the dearly departed on All Souls Day. To bring you, and your friends, in the mood, we are offering these three games together in a single “Day of the Dead” Bundle. And this time you can choose what you would like to pay for it!